Jill Johnson was ahead of the curve. As far back as 1980, this daughter of a drug store pharmacist felt an inkling of destiny as she drove to college through undulating green fields in Barry County south of Grand Rapids. Mix in a love of animals and the outdoors she absorbed from her mother and it's not altogether shocking where she stands today: Managing a 170-acre organic livestock operation called Crane Dance Farm in Barry County, taxing work that in the height of summer keeps her going from dawn to past dark. There are portable fences to move, plugged grain augers to clean, blown tractor hydraulic lines to fix, animals to tend to – a list that some days seems to stretch to the horizon. Turns out Johnson, 52, has lots of company in Michigan, as the number of women farm operators has grown significantly in the past few decades. It's still a male-dominated field, but one where a farmer Jill is hardly a rarity – especially on small farms that cater to the locally sourced food movement. According to the U.S. Department of Agriculture, the number of acres managed by female principal operators in Michigan doubled from 252,000 in 1978 to 552,000 in 2007. From 2002 to 2007, the number of farms managed by women grew by 40 percent, from 5,904 in 2002 to 8,275 in 2007, before declining to 7,409 in 2012. That's still 25 percent higher than in 2002. And the recent decline may well be tied to the Great Recession, since the number of principal male farmers also fell from 2007 to 2012, from 47,739 in 2007 to 44,785 in 2012. For Michigan’s women farmers, small-scale farms comprise much of the total. In 2012, two-thirds of farms run by women held fewer than 50 acres. This new crop of farmer in Michigan ranges from a Ph.D sociologist who specializes in artisan salsas and sauces to a young Google worker raising hundreds of free-range chickens, to a registered nurse who gave up that career to farm. “The local food movement, farmers markets, the concern about food safety, the interest in organic vegetables has really been a growth area that women are tapping into,” said Kif Hurlburt of the USDA National Agriculture Statistic Service regional office, which oversees Michigan, Indiana and Ohio. It’s a promising niche. A 2014 survey found that two-thirds of Americans were willing to pay more for local food, in part because they found it healthier with better taste. That description surely fits the curiously-named farm operation headed by Stefanie Stauffer, Nightshade Farm Industries. Established in 2010 on a half-acre plot near Ypsilanti, it has neither nightshade nor seems aptly described as an industry. 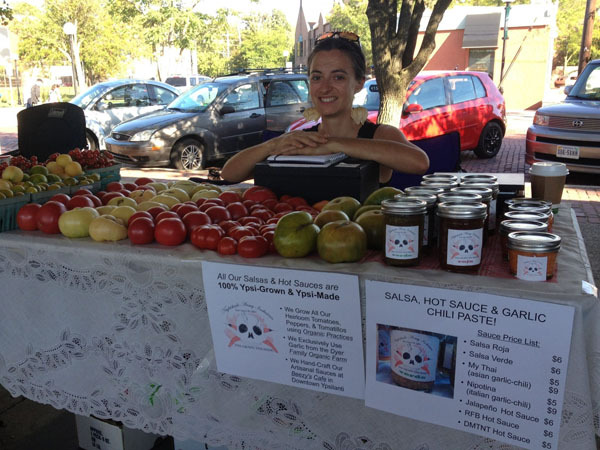 It is very much a niche operation, built around heirloom tomato and hot pepper specialty products that include hot sauces and salsas, as well as vegetables including kale, okra, beans and chard sold at the local farm market. Stauffer, 35, has a doctorate in sociology, and also manages a 44-acre incubator farm operation just outside Ann Arbor in which six of 11 farms are run by women. Called the Tilian Farm Development Center, it is managed and funded by Michigan Food and Farming Systems, a nonprofit housed at Michigan State University started in 1998 to support beginning farmers. In addition to affordable lease rates for land, it offers farmers access to equipment, infrastructure and passive solar greenhouse space. Stauffer also grows tomatoes and peppers in a greenhouse at the center. “I've feel like I've broken the mold,” Stauffer said, regarding her unlikely combination of gender, academic credentials and vocation. Regardless of background, Stauffer sees other women drawn to farming for motives that parallel her own: A rejection of the factory-farm corporate model of agriculture in favor of locally-sourced produce and livestock. Stauffer said that while ideals matters, when she screens applicants to Tilian she is looking for more than people with starry-eyed dreams of getting close to the earth. “I am looking for a business model,” she said. By day, Nicole Ivey is an account manager for Google's sales and operation office in Ann Arbor. After work, she puts on muck boots at Ivey Farm at the Tilian Farm Development Center, where she raises free-range chickens for their meat and heritage breed laying chickens on two acres of land. At 22, this is her first year as a farmer. She credits Stauffer and others at the center for helping her. “If you have questions, there are people to go to,” she said. Ivey said she expects to sell 220 meat chickens this year, a modest beginning for what she hopes will become a larger venture in the years ahead. Her business model includes plans to market chicken to local restaurants, noting the difference in how her chickens are raised and fed compared with supermarket fowl. “Even when a store says their chickens are organic, they do not go outside. My chickens are outside,” she said. “They are fed organic feed but they are running around and they have access to grass and bugs. They are pretty spoiled as far as chickens go. As for the future, Ivey isn't ready to give up her day job just yet. Vicki Zilke is co-partner on a 27-acre vegetable farm about 15 miles south of Ann Arbor with her husband, Tom. It is a second career for both. A registered nurse, Zilke, 56, said their decision to plunge into farming was born of a health crisis six years ago, when Tom, who ran a landscaping business, had symptoms that originally appeared to be lung cancer. After weeks of uncertainty, it turned out to be a false alarm. Zilke retains her nursing license, but has all but ceased practice since the farm has become an all-encompassing endeavor. Under the slogan, “Locally grown by farmers you know,” Zilke Vegetable Farm markets vegetables, fruits and herbs that its website states are non-GMO and grown without chemicals. They are sold at a farm stand and a variety of local farmers markets. Zilke said there are times she questions the financial wisdom of their decision, since she gave up a career that paid considerably more than her share of the farm's income. Like Zilke, Jill Johnson traveled a roundabout road to what would become Crane Dance Farm. She graduated from Albion College in 1985 with a degree in professional writing, then from Western Michigan University in 1986 with a degree in agriculture. With student loans to pay off and money to save for down payment on a farm, she worked in retail management, as manager of a food cooperative in Grand Rapids, manager of a barn for a Wisconsin veal company and doing public relations for a chiropractic group. She started small, purchasing five acres of land in 1996 in Barry County that included a falling-down barn and house and terrain littered with garbage and leftover metal scrap from a century of farming. She spent the first year or two cleaning out the land. On the side, she raised a few chickens, goats and pigs. But Johnson was exhausted after a few years of this, wondering how she could carry on. She eventually became partners with a retired high school English teacher, Mary Wills, who began as a volunteer on the farm and is now co-owner. They own 55 acres and lease another 115, where they raise heirloom pork, grass-fed beef and lamb and harvest eggs from pastured chickens. The eggs typically sell out in an hour or two at the Fulton Street Farmers Market in Grand Rapids. “If Mary hadn't come along, the farm wouldn't exist,” Johnson said. She concedes that men have certain advantages over women in farming, chief among them sheer physical strength that comes in handy at times. “We are not big people,” Johnson said. But she said she believes women have it over men in other ways. Not long ago, Johnson was out in the field and a neighbor stopped by to chat. It’s a remark that still rankles. “It's far from a hobby farm,” she said. Perhaps agriculture has reached a tipping point, not just in terms of gender, but more importantly, in terms of mission-driven, knowledgeable practitioners. We should all try to reward farmers who are concerned about food safety and the sustainability of land. We should also salute those hard working individuals who fight to stem the tides of GMOs, herbicides and pesticides. May their locally sourced farms thrive! As a woman who grew up farming and who continues to be a partner in my family farm today, I find this article to be misleading and very dissapointing. It is highly swayed to "organics" and small hobby type farms. I grew up on a large grain and cattle operation that we still run today (conventionally). There is nothing unsustainable about our practice(there is room for improvement but we are constantly trying and working to improve). We grow GMO canola which has been a major improvement in our operation. Gmo allows us to use considerably less chemical, and is much more sustainable and environmentally friendly. I am not, and have never been "intimidated" by equipment. I was operating tractors at a young age and loved every minute of it. Our farming practice is large, yet family owned and operated. We are stewards of the land, trying to improve our farming techniques constantly to leave a better, more productive farm for my children and future generations. Agricutural technology and biotechnology are helping us to do that. It's nice to see more women moving into the agriculture field, and if you want to farm organic that's fantastic. I am happy that there is room for all different practices of agriculture. I just don't agree with stating that one way is "better" than another without having all the facts. There are many women that operate (or help operate) large family and factory farms, as well as women who operate smaller farms. It's a fantastic thing that women are getting more involved and taking on management roles in farming. It's just disappointing to read something like this and find it to be so misleading. While I'm excited to see an article featuring the ever increasing women in agriculture, I feel like this small sample of women represent just a tiny part of the amazing variance of Michigan agriculture. Women can and do, in fact, operate and work on more than just small niche farms. As a woman in agriculture, I feel uncomfortable being represented by these ladies' comments and personal experiences. While I commend them and their work and am happy there is room for all types of farms, I'm disappointed that this might be the view that is spread as representing all women in the industry. I work very hard to be taken seriously on farming operations. Johnson said it very well in the article, “it’s hard to get somebody to talk to us because we are women. They don’t necessarily think we are serious.” However, she may be the reason why, as she had just previously said, “Women are a little bit more intimidated by equipment, so they are more careful." Thank you ladies for providing great options for people who really value your type of product! But there are also phenomenal ladies making a difference in high demand consumer products that should have been thrown in the mix.